The drawing room at Glanleam House, Valentia showing Lady Fitzgerald and her daughter. c. 1880. A NEW series of photos and recordings detailing the extraordinary history of the great houses of Kerry and Cork will be launched next month. 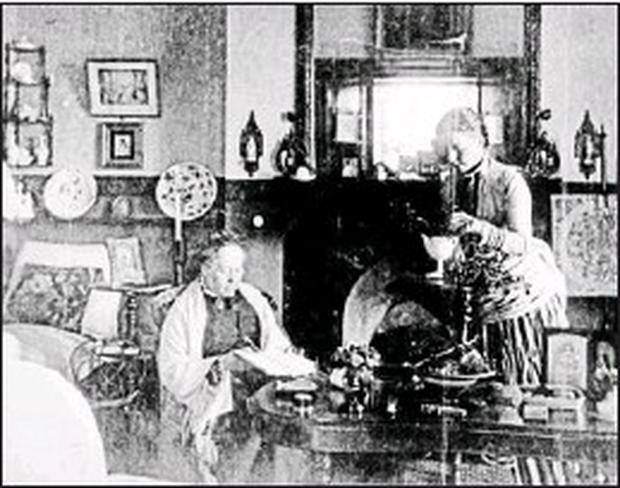 Compiled by Kerry based historians Maurice and Jane O'Keeffe of Tralee the Great houses of Cork and Kerry Project was completed as part of the Irish Life and Lore oral history series. The Great Houses series is made up of 51 hour long recordings detailing the history of the great houses of Cork and Kerry as told by the families who lived in them. The recordings are accompanied by a fascinating illustrated and indexed catalogue which features many never before seen photos of life in Kerry's great houses dating back to the late 1800s. Among the Kerry families included in the project are the The Denny family of Tralee Castle and Churchill House, The Butler family of Waterville House and Belville House, Portmagee ,The Leslie family of Tarbert House, The O`Connells of Lakeview House Killarney and Derrynane House and the Fitzgerald Knights of Kerry from Glanleam House in Valentia. This valuable historical project was funded by Brian McCarthy of Fexco in Killorglin without whose generous assistance Maurice and Jane O'Keeffe said the work could not have been completed. The project was launched in Cork late last month and it will be formally launched in Kerry at the County Library, Tralee on March 1 at 7pm.